Ever since the invention of the phonograph in 1876, music has been a popular source of home entertainment. In recent years, the compact disc has become the playback medium of choice for recorded music. A compact disc, or CD, is an optical storage medium with digital data recorded on it. The digital data can be in the form of audio, video, or computer information. When the CD is played, the information is read or detected by a tightly focused light source called a laser (thus the name optical medium). This article will focus on audio compact discs, which are used to play back recorded music. The history of the compact disc can be traced back to the development of electronic technology and particularly digital electronic technology in the 1960s. Although the first applications of this technology were not in the recording area, it found increasing use in audio components as the technology evolved. During the same period, many companies started experimenting with optical information storage and laser technology. Among these companies, electronic giants Sony and Philips made notable progress in this area. By the 1970s, digital and optical technologies had reached a level where they could be combined to develop a single audio system. These technologies provided solutions to the three main challenges faced by the developers of digital audio. The first challenge was to find a suitable method for recording audio signals in digital format, a process known as audio encoding. A practical method of audio encoding was developed from the theories published by C. Shannon in 1948. This method, known as pulse code modulation (PCM), is a technique that samples a sound during a short time interval and converts the sample to a numerical value that is then modulated or stored for later retrieval. The storing of audio signals in digital form requires a large amount of data. For instance, to store one second of music requires one million bits of data. The next challenge, therefore, was to find a suitable storage medium to accommodate any significant amount of sound. The solution to this problem came in the form of optical discs. An optical disc can store large amounts of data tightly compressed together. For example, one million bits of data on a CD can occupy an area smaller than a pinhead. This information is read by means of a laser beam that is capable of focusing on a very narrow area as small as 1/2500th of an inch. The final challenge of digital audio was to process the densely packed information on compact discs quickly enough to produce continuous music. The solution was provided by the development of integrated circuit technology, which allow the processing of millions of computations in just micro-seconds. By the late 1970s, a common set of standards for the optical storage discs had been developed by the joint efforts of Sony and Philips. A consortium of 35 hardware manufacturers agreed to adopt this standard in 1981 and the first compact discs and compact disc players were introduced in the market in 1982. Making a compact disc involves first preparing a glass "disc master." This master is then encoded with the desired information and put through a series of electroforming steps. 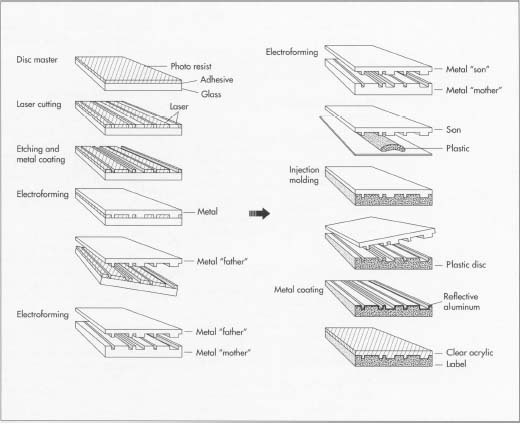 In electroforming, metal layers are deposited on the glass master using electric currents. When the final master version is ready, its information is transfered onto a plastic disc. A reflective aluminum layer is applied, followed by a clear acrylic protective layer, and finally the label. A base layer made of a polycarbonate plastic. A thin layer of aluminum coating over the polycarbonate plastic. A clear protective acrylic coating over the aluminum layer. 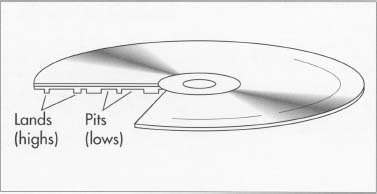 Some manufacturers use a silver or even gold layer instead of the aluminum layer in the manufacture of their compact discs. The compact disc is designed strictly according to the standards established by Sony and Philips in order to maintain universal compatibility. A CD is 4.72 inches (120 millimeters) in diameter and .047 inches (1.2 millimeters) thick. The positioning hole in the middle is .59 of an inch (15 millimeters) in diameter. A CD usually weighs around .53 of an ounce (15 grams). A standard CD can store up to 74 minutes of data. However, most CDs contain only about 50 minutes of music, all of which is recorded on only one side of the CD (the underside). The recorded data on the CD takes the form of a continuous spiral starting from the inside and moving outward. This spiral or track consists of a series of indentations called pits, separated by sections called lands. A tiny laser beam moving along the track reflects light back to a photo sensor. The sensor sees more light when it is on a land than when it is on a pit, and these variations in light intensity are converted into electrical signals that represent the music originally recorded. Compact discs must be manufactured under very clean and dust free conditions in a "clean room," which is kept free from virtually all dust particles. The air in the room is specially filtered to keep out dirt, and occupants of the room must wear special clothing. Because an average dust particle is 100 times larger than the average pit and land on a CD, even the smallest dust particle can render a disc useless. 1 The original music is first recorded onto a digital audio tape. Next, the audio program is transferred to a 3/4-inch (1.9 centimeters) video tape, and then data (called subcodes) used for indexing and tracking the music is added to the audio data on the tape. At this point, the tape is called a pre-master. 2 The pre-master tape will be used to create the disc master (also called the glass master), which is a disc made from specially prepared glass. The glass is polished to a smooth finish and coated with a layer of adhesive and a layer of photoresist material. The disc is approximately 9.45 inches (240 millimeters) in diameter and .24 of an inch (six millimeters) thick. After the adhesive and photoresist are applied, the disc is cured in an oven. 3 Next, both the pre-master tape and the disc master are put into a complex laser cutting machine. The machine plays back the audio program on the pre-master tape. As it does so, the program is transferred to a device called a CD encoder, which in turn generates an electrical signal. This signal powers a laser beam, which exposes or "cuts" grooves into the photoresist coating on the glass disc (the disc master). 4 The grooves that have been exposed are then etched away by chemicals; these etched grooves will form the pits of the CD's surface. A metal coating, usually silver, is then applied to the disc. The disc master now contains the exact pit-and-land track that the finished CD will have. 5 After etching, the disc master undergoes a process called electroforming, in which another metal layer such as nickel is deposited onto the disc's surface. The phrase "electro" is used because the metal is deposited using an electric current. The disc is bathed in an electrolytic solution, such as nickel solphamate, and as the electric current is applied, a layer of metal forms on the disc master. The thickness of this metal layer is strictly controlled. 6 Next, the newly applied metal layer is pulled apart from the disc master, which is put aside. The metal layer, or father, contains a negative impression of the disc master track; in other words, the track on the metal layer is an exact replica, but in reverse, of the track on the disc master. 7 The metal father then undergoes further electroforming to produce one or more mothers, which are simply metal layers that again have positive impressions of the original disc master track. Using the same electroforming process, each mother then produces a son (also called a stamper) with a negative impression of the track. It is the son that is then used to create the actual CD. 8 After being separated from the mother, the metal son is rinsed, dried, polished and put in a punching machine that cuts out the center hole and forms the desired outside diameter. 9 The metal son is then put into a hollow cavity—a die—of the proper disc shape in an injection molding machine. Molten polycarbonate plastic is then poured into this die to form around the metal son. Once cooled, the plastic is shaped like the son, with the pits and grooves—once again in a positive impression of the original disc master track—formed into one side. A finished compact disc contains a series of tracks or indentations called "lands" and "pits." A CD player uses a laser beam to read these layers and convert the reflection first into an electrical signal and then into music. this stage. Next, the disc is scanned for flaws such as water bubbles, dust particles, and warps. If a flaw is found, the disc must be discarded. 11 If the disc meets the quality standards, I it is then coated with an extremely thin, reflective layer of aluminum. The coating is applied using vacuum deposition. In this process, aluminum is put into a vacuum chamber and heated to the point of evaporation, which allows it to be applied evenly to the plastic disc. 12 Finally, a clear acrylic plastic is applied to the disc to help protect the underlying layers from physical damage such as scratches. After the label is printed, generally using a silk-screening process, the compact disc is complete and ready for packaging and shipment. A compact disc is a very precise and accurate device. The microscopic size of the data does not allow for any errors in the manufacturing process. The smallest of dust particles can render a disc unreadable. The first quality control concern is to ensure that the clean room environment is properly monitored, with controlled temperature, humidity, and filtering systems. Beyond that, quality control checkpoints are built into the manufacturing process. The disc master, for instance, is inspected for smoothness and its photoresist surface for proper thickness by means of laser equipment. At later stages in the process, such as before and after the aluminum coating is deposited and after the protective acrylic coating is applied, the disc is checked automatically for warps, bubbles, dust particles, and encoding errors on the spiral track. This mechanical checking is combined with human inspection using polarized light, which allows the human eye to spot defective pits in the track. In addition to checking the discs, the equipment used to manufacture them must be carefully maintained. The laser cutting machine, for instance, must be very stable, because any vibration would make proper cutting impossible. If strict quality control is not maintained, the rejection rate of CDs can be very high. The massive storage capabilities, accuracy of data, and relative immunity from wear and tear will continue to make compact discs a popular medium for music and video applications. The hottest new product stirring public interest is CD-Interactive or CD-I, a multimedia system that allows users to interact with computers and television. Manufacturing techniques will continue to be streamlined and improved, requiring smaller facilities and less human intervention in the process and resulting in lower CD rejection rates. Already in the first decade of CD manufacture, the manufacturing and quality control processes have become almost completely automated. Brewer, Bryan. The Compact Disc Book: A Complete Guide to the Digital Sound of the Future. Harcourt Brace, 1987. Nakajima, H. Compact Disc Technology. IOS Press, 1991. Pohlmann, Ken C. Principles of Digital Audio. 1985. Pohlmann, Ken C. The Compact Disk Handbook, 2nd ed., A-R Editions, 1992. Bernard, Josef. "Compact Discs—-Bit by Bit," Radio-Electronics. August, 1986, p. 62. Birchall, Steve. "The Magic of CD Manufacturing," Stereo Review. October, 1986, p. 67.
i really appriciate your regading this aspect. i hope you may include newer information too. BUT not really a valid answer to how they make cd's today, or is it ? Since when was this absolete ? after the cd/dvd recorder arrived ? Very well done explanation. Perhaps it would be good to elaborate a bit on how the "lands" represent 0 and the "pits" represent 1 creating a binary sequence, which is how the CD player reads the data from that particular disc type. But etching grooves is not the only way to make a CD. CD-Rs have no bumps on them and instead use a special dye in between the layers of the CD that darkens when hit with a concentrated laser beam (from the heat) and is clear when untouched. By blinking the laser at the correct intervals at a more intense than normal laser beam, it creates a series of dark and light spots that CD players are able to read (similar to the lands and pits concept).